Some of my favorite cookbooks are Cooking Light Annual Recipes, this recipe struck my eye out of the 2004 edition. As a child my mother cooked a lot with curry and to be honest it burned me out on it. Mr.Picky likes it so I thought I should give it a try and cook a curry dish. This dish was great and easy. Allow yourself at least an hour to cook though. The only thing I would do differently is add some more spice for a fuller flavor. I have adjusted the recipe to what I would do next time. We served our curried pork over white rice with seasoned roasted cauliflower. In a large nonstick skillet lightly sprayed with cooking spray or olive oil saute onions and peppers over medium heat for about 3 minutes. Add in mushrooms and cook another 2 minutes. Place vegetables in a 11 x 7″ baking dish that has been lightly greased. Combine flour, curry powder,salt, and pepper in a bowl. Add pork and toss to coat. In the same pan you used for vegetables, spray again with oil. Over medium high heat add pork mixture and cook about 5 minutes until pork has browned on each side. Pour pork mixture over vegetables in baking dish. Now pour the can of tomatoes over the whole dish. Cover and bake at 350 degrees for 1 hour or until tender. 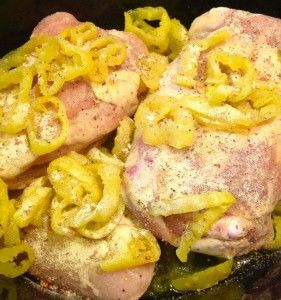 Posted in Meat/Fish, One Dish Meals, Recipes and tagged Bake, bell peppers, boneless pork loin, COOK, curried pork, curry, Dinner, easy, Flour, Home, onions, Oven, pork loin roast, Recipe, Rice, salt, tomatoes. Bookmark the permalink. I don’t care for beef to often but my exception to the rule is when I get to eat Corned Beef Brisket. I usually prepare it a few times a year. Using the same method as I usually do I kicked it up to another level this time. We don’t eat corned beef as most do, we save ours and prepare reuben sandwiches or corned beef sandwiches until it is gone, sometimes we make it into corned beef hash. With the few added ingredients my corned beef had a whole new level of flavor. It was so good, Mr.Picky and the kids had a hard time keeping their fingers back as I was slicing it. Be warned corned beef stinks when it is cooking. In fact Mr.Picky walked in the door and asked if the dog pooped in the house. But the smell is nothing like the flavor. I can tell that is smells like corned beef and not something produced by the dog. In fact I don’t think they smell anything alike but it is a strong odor. My mother in-law can not cook it in her house because Mr.Picky’s father the Pickiest father in-law can not take the smell. So maybe if preparing for guest light some good candles or put the slow cooker in the garage. Place brisket with juices from the package in the slow cooker. Slice and peel the fat layer off and discard. Add the seasoning package that the corned beef comes with, the cloves, and peppercorns. Pour in the Guinness stout and then enough water to cover the corned beef completely. Turn slow cooker to high and cook for about 8 hours. Remove the brisket and discard the juices cooked in. Slice brisket on an angle against the grain. Posted in Meat/Fish, Recipes and tagged cloves, COOK, Corned beef, corned beef brisket, corned beef sandwiches, crock pot, Dinner, guinness stout, Home, meal, Meat, peppercorns, reuben sandwiches, Slow cooker, water. Bookmark the permalink. Earlier that day I had been near the store when Mr.Picky messaged me to pick up a can of pineapple chucks. I did as he asked but was confused because Mr.Picky does not like canned pineapple and I was curious to know what he was making. I was headed to play my monthly game of Bunco. Mr.Picky offered to prepare dinner for him and the kids. I don’t usually leave until after dinner and I usually wait to eat until I get to Bunco. He went on the faithful Allrecipes and found Waikiki Meatballs Recipe. I was shocked and so was he that he was making sweet and sour meatballs. He does not like hot pineapple or sweet and sour sauce. Like a good dad he figured the kids would love it. Well it turned out great and both Mr.Picky and the kids enjoyed it. He was so proud of his homemade meatballs. I ended up eating two dinners that night because of course I needed to sample Mr.Picky’s cooking. This will continue into the dinner rotation of recipes. We slightly altered the recipe because the bell peppers needed to be cooked just a bit more. I would add a bit more vinegar as it was a bit sweet for me. But it was still great and could be left as is. In a bowl combine beef, crackers, onion, milk, egg, ginger, and salt mix until evenly incorporated. Scoop meat into even size balls 1-2 Tbs of meat per ball. Heat olive oil in a medium heat skillet and brown meatballs until cooked through. Add the green peppers into cook the last few minutes of cooking on the meatballs. Drain any fat if there is any. In a small bowl combine cornstarch, sugar, pineapple juice, vinegar, and soy sauce until smooth. Pour the sauce over the meatballs and continue to cook and stir about 5 minutes until sauce has thickened. Add the pineapple chunks and continue to heat through. Posted in Meat/Fish, One Dish Meals, Recipes and tagged amino acids, beef meatballs, COOK, Corn starch, cracker crumbs, Dinner, green pepper, hawaiian food, Home, meatballs, pineapple, Recipe, Rice, Soy sauce, sweat and sour. Bookmark the permalink. Rarely do I ever feel the need to prepare red meat or want to eat it. Something inside of me was craving flank steak. My grandparents had prepared us some wonderful marinated flank steak the last time we were visiting. Mr.Picky was a fan of this great flank steak, even though he is often not a fan of this cut of meat. Looking for my recipe I was given, I was having no luck. I searched everywhere for my disc full of recipes and could not find it. Somewhere in our move I lost it, well not lost but put it somewhere special. I remember just before we moved I came across it in an odd spot and put it somewhere for safe keeping. I don’t often misplace things and searched every logical place. One day I will find it. Until I find it I found this recipe for Citrus Marinated Flank Steak. The flavors seemed similar to what we ate and I figured it would do until I can get my hands on the right recipe. This recipe turned out great, not quite as much flavor as I was expecting even after I marinated it longer. Mr.Picky approved and said I could prepare it again. Score steak on both sides. Place all ingredients besides the stead in a jar or blender, blend with an immersion blender until smooth. Place steak in a plastic bag and pour in marinade. Allow to marinade at room temperature for 2 hours. Or overnight in the refrigerator. Prepare the grill until high heat is reached and the coals are red hot. Grill about 3-4 minutes on each side. Move away from direct heat and cook another 10 minutes longer. Meat should reach about 145 degrees. This process took us a bit longer because we were cooking in the snow. Remove meat to a cutting board, cover in foil and allow to rest for 10 minutes before slicing. Slice meat against the grain in thin strips to serve. Posted in Meat/Fish, Recipes and tagged BBQ, charcoal, Chili powder, Cilantro, citrus, coals, COOK, Cumin, flank steak, Garlic, grilling, Home, limes, marinade, Olive oil, oranges, Recipe, steak, thinly sliced steak. Bookmark the permalink.